When I registered for the BAA Distance Medley Series back in January, I had no idea that I would end up on the sidelines (practically) for two months prior to the final race in October. 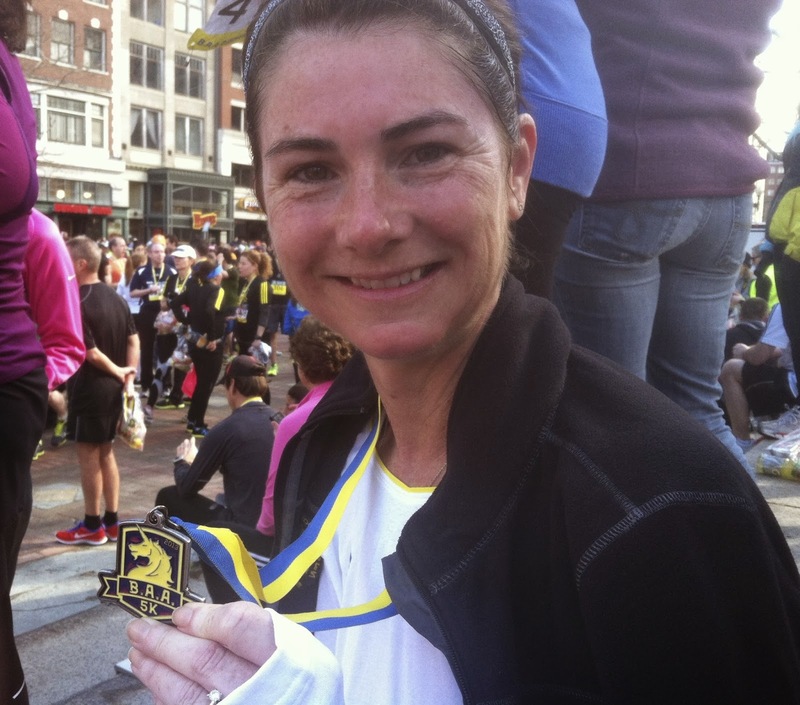 In April I ran the BAA 5K the day before the Boston Marathon and crossed the finish line on Boylston. In June, my youngest step-daughter joined me in running the BAA 10K along Commonwealth Ave and into Boston Commons. 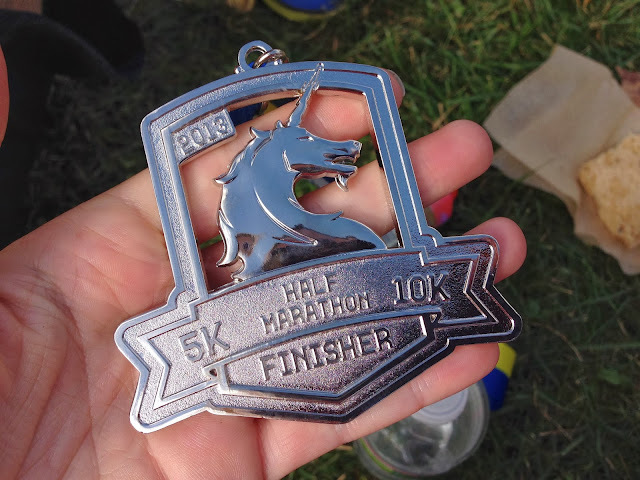 After accumulating two DNSs (one in August and another just two weeks ago), I was facing a tough decision about the BAA Half Marathon. My last long run of nine miles was on August 11. Since then I have been battling a hamstring injury. Two months of rest, PT, biking, walking, and only 8 "test" run miles and I still wanted to run the half marathon. WHY? Why would I even consider doing this? To get that distance medley medal. The kicker was that the BAA had a 2 hour 30 minute cut off (supposedly) to get the medal. After chatting with running friends on Twitter, it sounded like we had a 3 hour window to "guarantee" race officials would still be handing out finisher's and medley medals. After mr.C offered his support to help me get across the finish line in under 3 hours, I decided to give it a try. After all, I had finished two out of the three races, I would get to see some of my running friends, and even if I didn't finish I would know that I did what I could. So we headed to Boston on Saturday to spend the day in Beantown and enjoy a nice anniversary dinner. After a little shopping, we eased back to the hotel to get ready for race morning. The right outfit can help with positive energy and I choose one of my favorite Oiselle running skirts, a pink Nike tank for Breast Cancer Awareness Month, a new Lululemon bra, and my #mezamashii Mizuno Wave Creation 14s. The BAA Half Marathon was held in Franklin Park south of the city. It was a quick walk to Mass Ave to catch the T to Forest Hills station where we loaded the shuttle bus to the park. Super easy and super organized. As I experienced in the past, the BAA also made it easy to pick up race shirts and drop off gear bags before the race start. There were more than 7,000 participants and their spectators, so finding my running friends wasn't easy, but I finally found Katherine. And then there were none...no more miles to run. Just pass through the finisher's area grabbing water, medals, and food. IT WAS AWESOME! Crossing the finish line could not have happened without the world's most amazing husband. In an attempt to show him my appreciation, I gave him my BAA Half Marathon medal. He did earn it after all! I wish I had more pictures from the course, but all I could focus on was moving my legs. Jamaica Pond had gorgeous views and the last miles took us through a small zoo inside Franklin Park. However, nothing compared to the amazing spectator signs lining the course. It still amazes me that we ran a half marathon after two months of non-running. Our official finish time of 2:42:12 also seems crazy good considering how under-trained we were and the lingering head cold I was still feeling. What's the craziest thing you've ever done for BLING? Way to go girlie!!! PROUD OF YOU! Awesome, well done! You did extremely well for 2 months of no training. I would have died! WOOT! GREAT job!! I totally would have run it, even under-trained, for the series medal.